Madrid Barajas Airport (MAD) is the busiest airport in Spain and connects millions of passengers a year to domestic and international destinations. Madrid MAD is based eight miles (13 kilometers) northeast of the city of Madrid and its four terminals are easy to connect to by road or rail. The Madrid underground system is accessible from the airport and a taxi journey from Madrid International to downtown Madrid takes about half an hour; suburban and national train networks are a short journey away via the underground. Madrid Airport is the major European hub for flights to Central and South America with more transatlantic flights departing from its runways than at any other Spanish airport. There is a modern and fully-equipped business center at Madrid Barajas Airport and airport lounges for VIP passengers. More than 10,000 parking spaces are available in seven car parks at Madrid Barajas, and travellers are well-provided for in terms of banking, business, dining, health and shopping facilities in the airport's terminals. The APM, an automatic underground train, transports passengers between the four terminals. 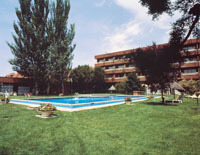 Madrid World Airport Guide provides you with access to a complete selection of Madrid airport hotels. Utilise the discounts offered directly from the hotel, with the assurance of secure booking. 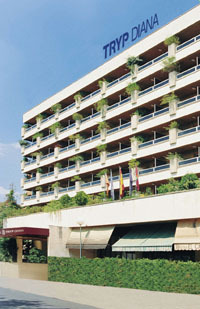 Extra services include airport car rental, airport car parking and flights to and from Madrid International Airport.